There’s nothing like the hearty goodness of delicious salisbury steak. You love it, the kids love it, and it makes for an easy meal for the whole family. 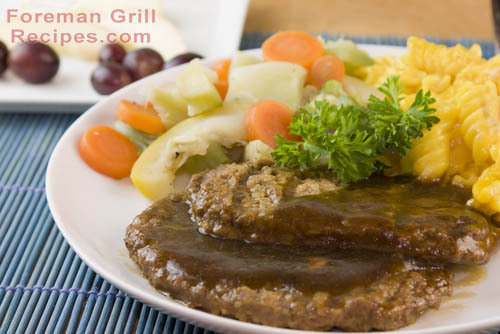 Your Foreman Grill is the perfect way to prepare fast and easy salisbury steak. Almost all of the ingredients are things you probably have on hand. A good lean ground beef makes for a delicious result. Try going with meat that is 85% lean. And don’t be shy with the gravy either! Combine ground beef, bread crumbs, egg, milk, onion powder, garlic powder, salt, pepper and ketchup in a bowl and mix well with hands. Shape into patties of about 1/4 pound each into the size of a traditional salisbury steak (oval shaped and about 1/4″ – 1/2″ thick). Preheat your Foreman Grill for at least 5 minutes with the lid closed. Use high setting if you have it. Add salisbury steaks to grill and close lid. Grill steaks for approximately 3-4 minutes. Be sure to check for doneness as times may vary. Melt butter in a small saucepan over low/medium heat. Slowly whisk in flour and continue whisking until all lumps are gone. Continue heating for about 5 minutes and stir constantly. Slowly add broth and keep stirring over low heat until sauce thickens (about 5 minutes). Add salt and pepper to taste. Salisbury steak goes perfectly with a creamy macaroni and cheese. Add some winterblend vegetables and you’ll have a meal you won’t forget. Or whip up some mashed potatoes and pour some of that delicious gravy over them too. Really, you can’t go wrong. Also, if you’re cooking for 1 person, make a couple of extra salisbury steaks and have for lunch the next day at the office. Your co-workers will be in awe when they see and smell how delicious it is!